Click here to download a PDF of the Reviewer's Guide or you can read it below. You can follow the steps of the Reviewer's Guide in your Delphi or RAD Studio full product or trial. 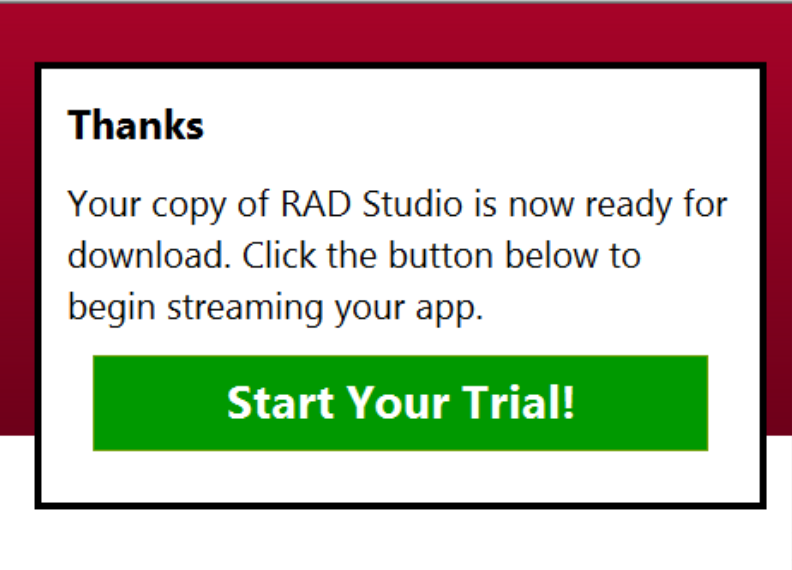 Click here to download a free RAD Studio trial. Click here for purchasing information. Thank you for your interest in reviewing RAD Studio XE 4, Embarcadero’s multi-device, true native app development solution for creating true native apps for Windows, Mac, and iOS with one source code base. This reviewer’s guide will give you an overview of some of the key benefits that developers will enjoy with RAD Studio XE4 as well as a walkthrough by building typical multi-device apps. Companies are under pressure to deliver apps that their customers can use in the office and on the road, but coding and managing these different versions can be costly and time-consuming. RAD Studio is the app development suite for companies that need to create true native apps for PCs, tablets, and smartphones and get them to market fast. With RAD Studio, you manage one codebase, one team, and one schedule, but support multiple platforms without sacrificing performance and user experience. True native apps run directly on the device with full access to all underlying capabilities, tighter security, and a better user experience. Please keep in mind that this Reviewer’s Guide is a starting point on the road to reviewing RAD Studio XE4. There are tons of features in the product. There is a wealth of additional information, videos, walkthroughs, and guides to help you get the most out of the product. Please review the full feature matrix, the RAD Studio XE4 product page and the Embarcadero Developer Network for the latest on the product. Multi-Device app development means developers don’t have to support multiple development projects to deliver their apps natively on multiple platforms (iOS, Windows, and Mac). Most vendors who support multi-device development do so via web technologies, scripting or VMs, which are not as optimal as our true native solution. Many of these vendors focus on mobile development solutions that do not support the creation of PC apps for Windows and Mac. RAD Studio, on the other hand, makes it easy to build script-free true native apps for multiple devices that expose the full range of capabilities and performance in the underlying devices. Building their app in RAD Studio eliminates the need to engage in multiple development efforts for the same application on multiple devices. This means they get to market faster on multiple devices for the first release – and every release after that – while keeping costs down. True Native app development lets developers deliver script-free device native apps optimized for each underlying hardware platform – creating faster, richer apps that end users love. Many other tool vendors are using the term “native” app development to describe web technologies and scripts wrapped into an app package to deliver an app-like user experience. This approach means that developers are limited in both performance and capabilities. Fast – Uncompromised native device performance with full native API and CPU control when you need it, and not limited by or slowed by script interpreters and VMs. Predictable – Apps run directly on the device CPU, as intended by the device vendors, and are not slowed by additional software layers and random garbage collection. Better User Experience (UX) – Apps take full advantage of device capabilities and performance. Rapid Prototyping lets you create a visual prototype, incorporate feedback, and get your app to market fast. Most visual prototyping environments only create a visual mock-up; they do not generate a working prototype. This means clients and team members can’t truly experience the app concept and developers also must start from scratch when moving from prototype to development. 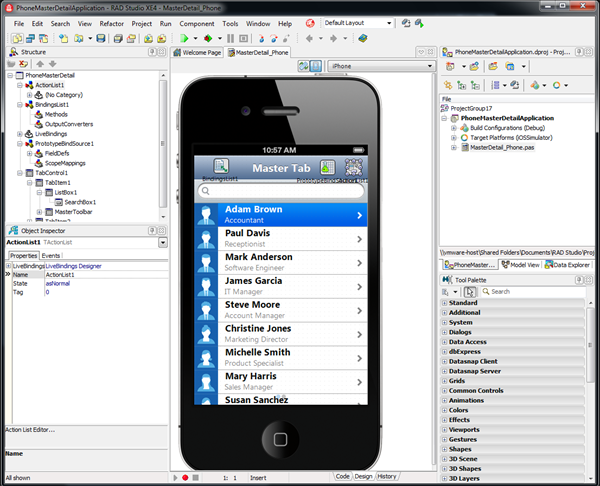 Rapid Prototyping in RAD Studio lets developers or designers quickly create no-code visual mockups with live data or simulated data and deploy to actual target devices (PC, phone, tablet) or simulate on Windows or Mac giving clients and team members a far more accurate and impressive prototype experience. RAD Studio prototypes use actual framework objects, so developers can go from prototype to development without wasted effort, saving development time and resources. RAD Studio XE4 delivers the best in multi-device development for PCs, tablets and smartphones. Use the new features of RAD Studio XE4 to deliver apps for iPhone and iPad in addition to Windows and Mac, connect with more data, more easily, and much more! You may obtain XE4 Trial as a download or an instant trial. A download and install can take approximately 1 hour depending on your download speed. 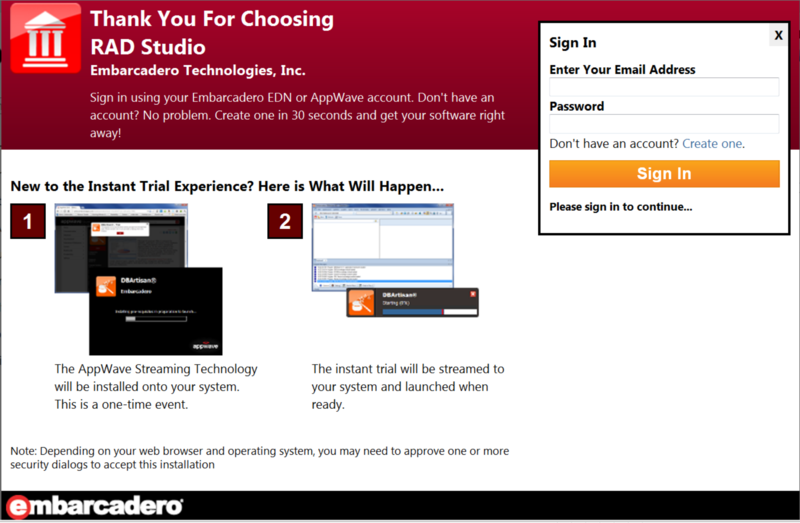 An instant trial typically takes less than 10 minutes depending on your download speed. Therefore, we recommend an instant trial for this product review. You will be presented with the following screen and a request to login with your Embarcadero Developer Network (EDN) email address and password. 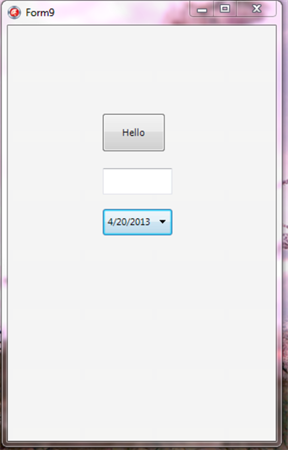 If you do not have an EDN account you can quickly create one from this screen. At this point the streaming technology, AppWave, will be downloaded and installed, then the streaming will begin. Please accept all prompts to move forward. After AppWave is installed, the trial begins to be streamed and you will see the following progress indicator at the bottom-right. 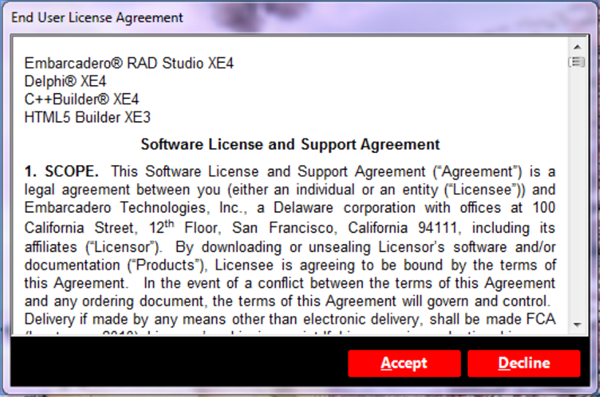 Shortly after this point the RAD Studio XE4 IDE will load and you are now ready to review the product. You will be presented with a Start Here welcome page. Creating apps for iOS requires a little bit of setup on a connected Mac so it is highly recommended that you watch the Get Set Up video. 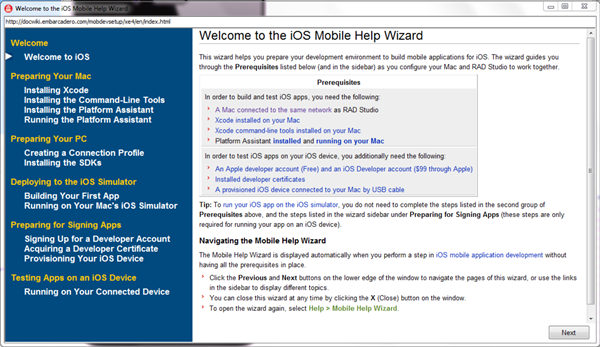 Alternatively, you can go through the detailed iOS Mobile Help Wizard setup tutorial by creating your first FireMonkey Mobile Application which is accessed from the File | New menu. This tutorial allows you to work at your own pace. RAD Studio XE4 supports building almost any type of native app imaginable but we’ll focus on a multi-device client app for this review. Note: This example requires the setup instructions were followed and completed at least to the point where an iOS app is deployable to a simulator. Deploying to device (which requires and Apple developer account, certificates, and a provisioned device) is not required for the example. 1) First, we will target mobile first by creating simple iOS client application. Select File | New | FireMonkey Mobile Application – Delphi. 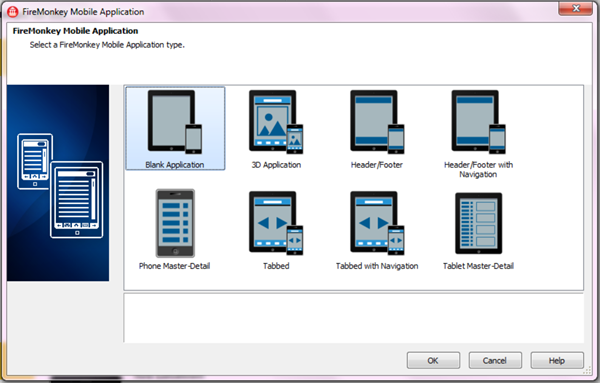 Select Blank Application from the available app templates. 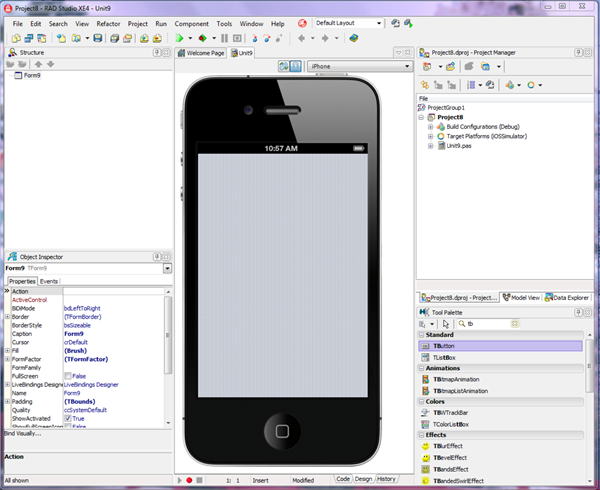 2) You will be presented with a designer for visually prototyping and creating your iOS application. 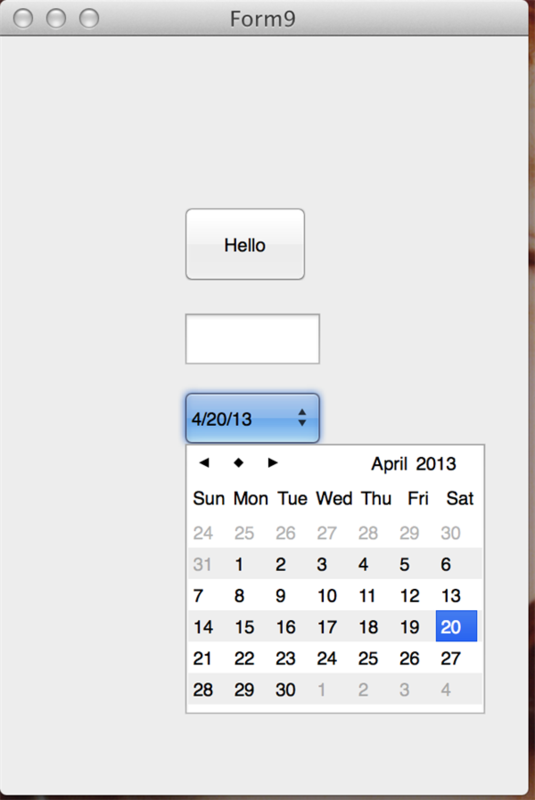 3) Drag and drop one TButton, one TEdit, and one TCalendarEdit component on the form. You can find these components by typing the component name into the Tool Palette on the bottom right of the IDE. 4) Change the text of TButton1 to “Hello” by selecting the component in the designer and typing ‘Hello’ into the Text property of that component. 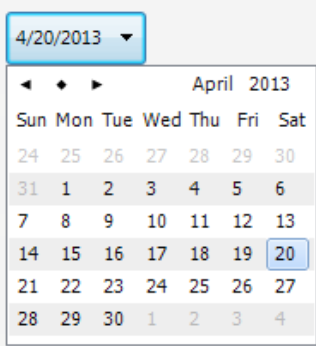 Double click on that button and add the following code into the generated event handler. 5) Now, let’s build and deploy this on the iOS simulator. (Please ensure you have followed the setup tutorial and have a working Platform Assistant Server connection). 6) After you build and deploy the application you will see the following information dialog. 7) Go to your Mac desktop that you setup in your Connection Manager Profile and you will see the FireMonkey application running in your simulator. By interacting with the controls, you will notice the following: The CalendarEdit controls uses the native iOS DateTime picker; the Button display its message in a native iOS dialog; and the Edit control supports native iOS functionality like selection and cut/copy/paste. 8) To make this application multi-device and target PC operating systems, we will create a new project in our projectgroup and share the exact same source code. Right click on your ProjectGroup in the Project Manager at the top-right of the IDE and select Add New Project. 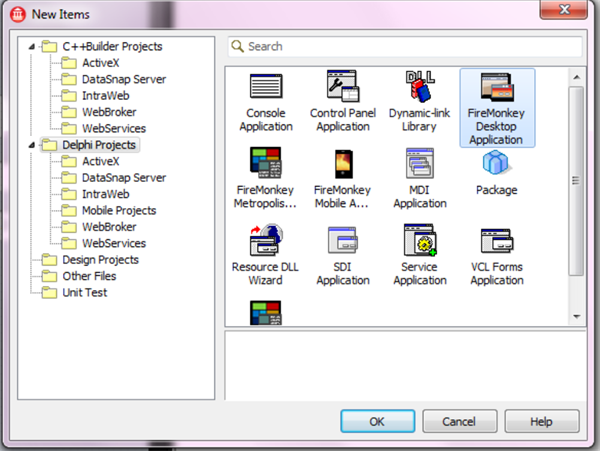 In the New Items Dialog, select FireMonkey Desktop Application from the Delphi Projects folder. The click OK.
9) Delete the main source file from the new Project by right-clicking on that file and selecting remove from project. 10) Now copy the app file from your iOS project by selecting it in the iOS project and dragging it to the new Project. 11) Build and run the project with the F9 key and you will see the application loading on your Windows 32-bit desktop. 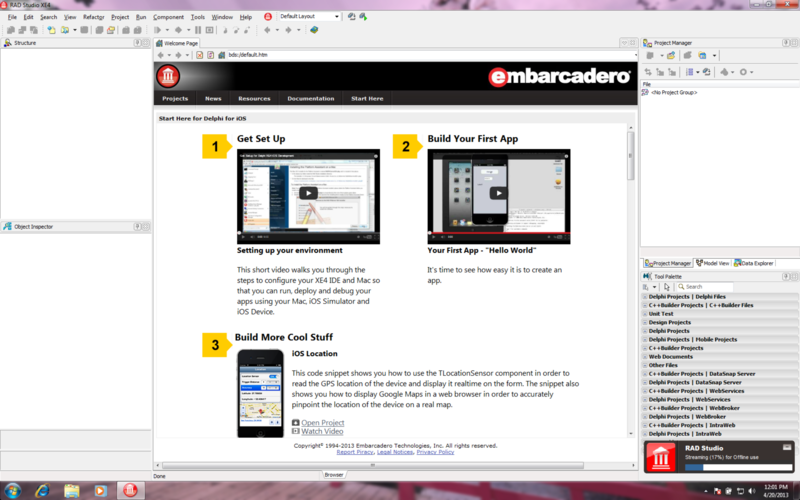 Notice, that FireMonkey renders with Windows controls. 12) Finally, let’s build and deploy this application for Mac OS X by adding the platform. To add the platform, right click on the Target Platform node and select Add Platform. Select Mac OS X from the Select Platform dialog and make the selected platform active. 13) After building and deploying your application go back to your Mac OS X desktop that you setup in your Connection Profile and you will see your app running. 14) Congratulations! You just created your first Multi-Device, True-Native app for Windows, Mac, and iOS visually and with the exact same source code base. 15) Take a look at plenty of other example projects in your Start Here welcome page by opening the project from the provided link. You should also go through the final steps to setup your device and deploy to device. Thank you for your review of RAD Studio XE4 the first Multi-Device, True-Native app development solution. 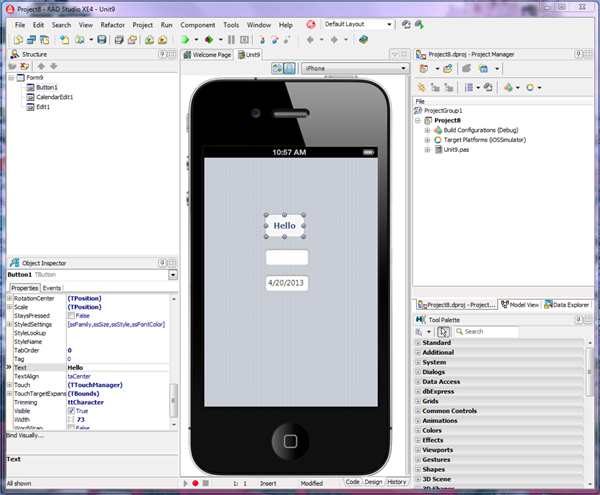 RAD Studio XE4 is a product suite that includes Delphi XE4, C++Builder XE4, HTML5 Builder, and InterBase. RAD Studio XE4 is available in four editions – Professional, Enterprise, Ultimate and Architect. Develop iOS, Windows and Mac device native apps with Delphi and C++Builder. Develop Web and mobile web apps with HTML5 Builder. InterBase, SQL Server, Oracle, DB2, Sybase, MySQL, ODBC and more. Amazon and Azure cloud. DataSnap multi-tier. 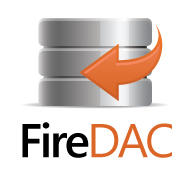 FireDAC data access components. InterBase, MySQL and SQLite. Amazon and Azure Cloud. Advanced compare and merge with bidirectional comparisons and merges of model and database structures. If you're interested in RAD Studio XE4, in combination with development tools; plus a complete range of database design, management and performance tools, Embarcadero All-Access is the solution for you. Embarcadero All-Access XE provides all the application development and database tools you need – when you need them. It's the easiest to use 'toolbox' solution for any size team of developers, architects, performance testers, and DBAs. All-Access is ideal for both large enterprise teams working on a wide range of technologies; and for smaller teams, consultants, and individuals who find time split across the software development life cycle.